Karnataka Public Service Commission (KPSC) will organize Assistant Controller and Audit Officer on 21 August 2016. The written test consist of two papers to be held in morning and evening session. Now KPSC Exam hall ticket are available online at kpsc.kar.nic.in. You can get them from below given link. 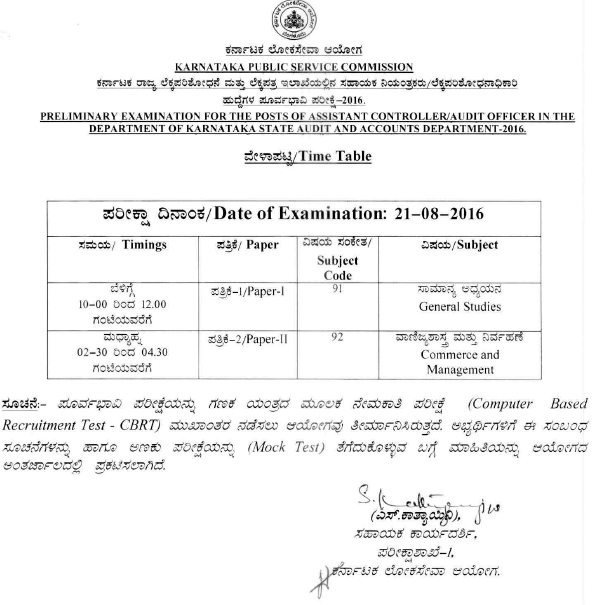 Karnataka Public Service Commission is going to conduct Preliminary written exam on 21 August 2016 for Asst. Controller and Audit Officer posts. For that, hall ticket are available for downloading. Candidates have to download KPSC hall tickets from below link. 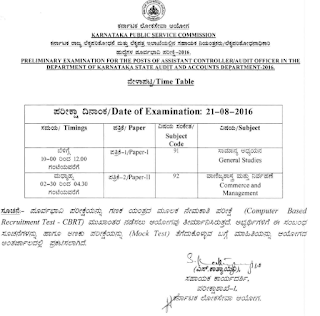 Earlier KPSC had given an advertisement for Assistant Controller and Audit Officer posts for which this written exam is scheduled to be organized through CBRT mode. In order to download the hall ticket for KPSC exam, candidates need to visit the direct link provided here (after release). It will take you directly to download page. Then candidates need to login with their Registration ID & Password (DOB: Which was provided in the application). After login there will be Hall ticket download tab displayed and you need to choose the assessment from the dropdown, later click on search button. After clicking on Download button, Hall Ticket will be downloaded in PDF format. Once you download the Hall ticket, go through all the mentioned instructions. You will get your KPSC hall ticket 2016 after the submission of details.